February 2012 – Fight Aging! A few years ago, researchers demonstrated a way to reverse some of the effects of Alzheimer's disease - a method that, interestingly, didn't involve targeting buildup of beta amyloid, presently the mainstream focus of the Alzheimer's research community. HDAC2 regulates the expression of a plethora of genes implicated in plasticity - the brain's ability to change in response to experience - and memory formation. ... Several HDAC inhibitors are currently in clinical trials as novel anticancer agents and may enter the pipeline for other diseases in the coming two to four years. ... The researchers conducted learning and memory tasks using transgenic mice that were induced to lose a significant number of brain cells. ... after taking HDAC inhibitors, the mice regained their long-term memories and ability to learn new tasks. In addition, mice genetically engineered to produce no HDAC2 at all exhibited enhanced memory formation. There are a few other studies out there to place question marks next to the primacy of amyloid in Alzheimer's disease - but you have to weigh them against the huge number of studies suggesting that it is important. But it's certainly the case that, given the ability, we would want to remove all such buildups of metabolic byproducts that appear with age. Young people don't have them, old people have them, ergo they may be part of the problem - and given limited information and large resources, why not work toward reversing all changes? Here's a recent update on HDAC2 research. To my eyes, the most promising aspect of this work is not that it will necessarily lead to a viable therapy - the odds are always low for every research program - but that it shows Alzheimer's to be a reversible disease until quite late in the game. The researchers found that in mice with Alzheimer's symptoms, HDAC2 (but not other HDACs) is overly abundant in the hippocampus, where new memories are formed. HDAC2 was most commonly found clinging to genes involved in synaptic plasticity - the brain's ability to strengthen and weaken connections between neurons in response to new information, which is critical to forming memories. In the affected mice, those genes also had much lower levels of acetylation and expression. .. The researchers then shut off HDAC2 in the hippocampi of mice with Alzheimer's symptoms, using a molecule called short hairpin RNA, which can be designed to bind to messenger RNA - the molecule that carries genetic instructions from DNA to the rest of the cell. With HDAC2 activity reduced [genes] required for synaptic plasticity and other learning and memory processes [were] expressed. In treated mice, synaptic density was greatly increased and the mice regained normal cognitive function. The researchers also analyzed postmortem brains of Alzheimer's patients and found elevated levels of HDAC2 in the hippocampus and entorhinal cortex, which play important roles in memory storage. The findings may explain why drugs that clear beta-amyloid proteins from the brains of Alzheimer's patients have offered only modest, if any, improvements in clinical trials ... The new study shows that beta amyloid also stimulates production of HDAC2, possibly initiating the blockade of learning and memory genes. ... We think that once this epigenetic blockade of gene expression is in place, clearing beta amyloid may not be sufficient to restore the active configuration of the chromatin. Which all sounds to me very much like real progress in understanding the mechanics of Alzheimer's, if it's all validated by the research community - incremental, true, but progress nonetheless. A mere 40% extension of life span in nematode worms via a novel method is a part of the general background noise of aging research nowadays: "The planar cell polarity (PCP) pathway is highly conserved from Drosophila to humans and a PCP-like pathway has recently been described in the nematode Caenorhabditis elegans. The developmental function of this pathway is to coordinate the orientation of cells or structures within the plane of an epithelium or to organize cell-cell intercalation required for correct morphogenesis. Here, we describe a novel role of VANG-1, the only C. elegans ortholog of the conserved PCP component Strabismus/Van Gogh. We show that two alleles of vang-1 and depletion of the protein by RNAi cause an increase of mean life span up to 40%. Consistent with the longevity phenotype vang-1 animals also show enhanced resistance to thermal- and oxidative stress and decreased lipofuscin accumulation. In addition, vang-1 mutants show defects like reduced brood size, decreased ovulation rate and prolonged reproductive span, which are also related to [longevity-enhancing genes]. The germline, but not the intestine or neurons, seems to be the primary site of vang-1 function. Life span extension in vang-1 mutants depends on the insulin/IGF-1-like receptor DAF-2 and DAF-16/FoxO transcription factor." The core point of SENS, the Strategies for Engineered Negligible Senescence, is explained in this short interview: "Could you elaborate on the idea mentioned on SENS: that it isn't necessary to know, from an 'engineering' perspective, everything about the degenerative processes that occur at the cellular level in order to treat aging in the way you envision? ... The basic point we're making there is to contrast the regenerative approach with the more traditional idea of trying to make metabolism create molecular and cellular damage more slowly. In order to do the latter, we would need to understand our biology massively better than we do at present, so as to avoid creating unforeseen side-effects. By contrast, with the regenerative approach we don't need to know much about how damage comes about: it's enough just to characterize the damage itself, so as to figure out ways to repair it. We're effectively sidestepping our ignorance of metabolism. ... Rejuvenation biotechnologies are simply regenerative therapies that pre-empt the diseases and disabilities of old age. They consist of molecular, cellular or whole-organ interventions that restore the structure of the target to something like how it was in early adulthood. This includes a variety of stem cell therapies, and also tissue engineering to create artificial organs. At SENS Foundation we don't work much on those types of therapy, because they're being very capably pursued elsewhere; rather, we focus on the more neglected but equally vital components of this 'divide-and-conquer' approach to combating aging. For example, we have a large project aimed at eliminating 'molecular garbage' from cells - indigestible material whose accumulation leads to diseases like atherosclerosis and macular degeneration - by introducing non-human enzymes to augment the body's natural ability to break down unwanted by-products of metabolism." The INDY gene in fruit flies was one of the earlier discoveries in the genetics of longevity. The initials of the name stand for I'm Not Dead Yet, an allusion to a Monty Python scene and one of many unusual names given to fly genes. You'll find a range of posts on INDY back in the Fight Aging! archives, following the research highlights over the years. Single gene mutations that extend life span are important tools for discovering pathways underlying aging. Of particular interest have been mutations in genes that are conserved across diverse species, since they suggest common mechanisms for aging regulation. For instance, mutations in insulin signaling genes affect the life span of yeast, worms, fruit flies, and mice ... Mutations in the Indy (I'm Not Dead Yet) gene dramatically extend the life span of the fruit fly, Drosophila melanogaster. Indy encodes the fly homolog of a mammalian di and tricarboxylate transporter involved in regulating plasma and liver levels of citrate and other Krebs cycle intermediates. Reduced expression of fly Indy or two of the C. elegans Indy homologs leads to an increase in life span. Fly and worm tissues that play key roles in intermediary metabolism are also the places where Indy genes are expressed. One of the mouse homologs of Indy (mIndy) is mainly expressed in the liver. It has been hypothesized that decreased INDY activity creates a state similar to caloric restriction (CR). This hypothesis is supported by the physiological similarities between Indy mutant flies on high calorie food and control flies on CR. Flies, worms, and mice show similar physiological changes when INDY expression is reduced, suggesting an evolutionarily conserved role for INDY in the regulation of metabolism. ... The studies on mice further suggest protection from metabolic syndrome and insulin resistance, whether the causative factors are diet or age. INDY is thus an attractive drug target for the amelioration of metabolic disorders associated with diet or advanced age, separate from any effects on longevity. This is one amongst many longevity-related genes, with likely many more yet to come. There is no shortage of opportunity for research groups wanting to work on the slow and incremental side of the road to the future of human longevity - to produce old-style drugs that change the long term operation of metabolism. The opportunities are there, but this is far from the best path to extending healthy human life spans. As regular readers know, there is another path forward - the SENS vision of biotechnologies based on repair of damage rather than slowing down the rate of damage. This is likely to be no more costly [and] yet will produce at the end of the day a true cure for aging, not just a marginal benefit and a couple of extra years of life. Here is a commentary on rapamycin research results (only available in PDF format, I'm afraid to say), which you might compare with an earlier commentary on the same work: "Anisimov et al. report that lifelong administration of rapamycin, starting at 2 mo of age, increases the maximum lifespan of female 129/Sv mice. This finding corroborates, in a different genetic background, the landmark discovery by the National Institute on Aging Intervention Testing Program (ITP) that rapamycin increases mouse lifespan in both sexes when given orally starting at either 9 or 20 mo of age. In contrast to the ITP study, Anisimov et al. administered rapamycin via subcutaneous injection, following a schedule of three injections per week for 2 weeks, followed by a 2 week break. The efficacy of this protocol suggests the intriguing possibility that intermittent administration may be one means of addressing potential side effects of chronic rapamycin usage, an obstacle to the clinical translation of these findings to a practical anti-aging drug in humans. Rapamycin is widely used clinically to suppress immune function during organ transplants, in addition to its use as an anticancer agent. Indeed, the established clinical use of this drug and its analogs represents a crucial opportunity in facilitating the move from basic research on the biology of aging toward agents that could prolong 'healthspan' by protecting against a wide spectrum of age-related diseases, while potentially extending the maximum human lifespan." Progress in stem cell medicine may lead to ways to restore the capacity for memory lost with aging by intervening in the activity of neural stem cells: researchers "have discovered an answer to the long-standing mystery of how brain cells can both remember new memories while also maintaining older ones. They found that specific neurons in a brain region called the dentate gyrus serve distinct roles in memory formation depending on whether the neural stem cells that produced them were of old versus young age. ... In animals, traumatic experiences and aging often lead to decline of the birth of new neurons in the dentate gyrus. In humans, recent studies found dentate gyrus dysfunction and related memory impairments during normal aging. ... In the study, the authors tested mice in two types of memory processes. Pattern separation is the process by which the brain distinguishes differences between similar events, like remembering two Madeleine cookies with different tastes. In contrast, pattern completion is used to recall detailed content of memories based on limited clues, like recalling who one was with when remembering the taste of the Madeleine cookies. ... Neuroscientists have long thought these two opposing and potentially competing processes occur in different neural circuits. The dentate gyrus, a structure with remarkable plasticity within the nervous system and its role in conditions from depression to epilepsy to traumatic brain injury - was thought to be engaged in pattern separation and the CA3 region in pattern completion. Instead, [researchers] found that dentate gyrus neurons may perform pattern separation or completion depending on the age of their cells." Modestly slow aging by reverse engineering calorie restriction to build a medication that captures some of its effects. Modestly slow aging by reverse engineering the difference between long-lived and short-lived people and build a medication that captures some of these effects. Modestly slow aging by reverse engineering the differences between long-lived and short-lived mammalian species and build a medication that captures some of these effects. These are all enormous projects of great complexity, stretching the bounds of the research community, that will likely take two or more decades to come to fruition (see how long the investigation of sirtuins has lasted to date, with no payoff in sight...) and yet even if they exceed their goals they will produce only a marginal benefit at the end of it. Likely no benefit at all for people who have grown old waiting - slowing aging does little for a person who is already mostly aged to death. As regular readers know, there is another path forward - the SENS vision of biotechnologies based on repair of damage rather than slowing down the rate of damage. This is likely to be no more costly than the research plans outlined above, and yet will produce at the end of the day a true cure for aging, not just a marginal benefit and a couple of extra years of life. This is the case because the plans above require understanding and safely producing new long-term working states in human metabolism - an undertaking of massive proportions. The SENS approach in contrast requires that researchers revert the short list of known age-related changes in human metabolism to restore it to the state it held when young; no new working state, just keep the metabolism that already works and repair it every so often. One prominent insanity amongst the many in this madhouse world we live in is that it has required a major and ongoing campaign of hard work and persuasion to convince even a tiny minority of researchers and funding sources to work on the obviously better plan (SENS) rather than the obviously worse plan (slowing aging a little bit). This is the most important strategic debate in medicine and biotechnology today, and for the foreseeable future, as the outcome will determine how long we all live. Louise Levy attends regular Tai-chi classes, retired three years ago from her secretarial job and says she would still be driving today if her car had not "conked out before I did." None of which would be particularly unusual, except Mrs. Levy is 101 years old. ... Mrs. Levy's long and generally healthy life is the focus of a fascinating scientific study, itself at the forefront of a little-noticed but radical approach to medical research. Turning upside down the traditional quest to understand and cure specific diseases, some researchers are examining instead healthy and long-lived humans and animals for their biological secrets. By reverse engineering the source of that vigour, scientists hope to develop drugs or supplements that could give less genetically fortunate people more protection against the ravages of aging and chronic illness. ... Those researchers struggle now for recognition in a medical establishment hived off into separate wars against individual diseases. A Canadian academic, however, is calling for a tectonic shift toward what he calls "positive biology." Solving the molecular mysteries of the healthy to stave off disease and aging would make the system "much more efficient," argues Professor Colin Farrelly of Queen's University in a recent paper in the journal of the European Molecular Biology Organization. "We think it will be more important for public health than the introduction of antibiotics," echoed Jay Olshansky, a public-health professor at the University of Illinois who has promoted a similar concept for several years. "This will be the medical breakthrough of the 21st century when it happens.... It's going to be huge." I suppose I should be pleased to see more media coverage of aging and longevity science - but when it comes down to it, the future for people who are entering middle age today will only be greatly changed by large-scale SENS or a similar repair-based grand-vision research program. For people of this age group the practical difference in terms of years lived between minimal longevity science and massive efforts to slow down aging via metabolic manipulation will be marginal to non-existent - if the division of support and research funding continues exactly as it is now, that is. To attain much longer healthy lives for we traditional-second-half-of-life folk, SENS must prosper, become the mainstream of the research community, and do so comparatively soon. A range of research currently underway focuses on limited but potentially effective ways to reprogram the immune system, so as to work around naturally occurring damage or compromise, or to boost immune system activity when it would do the most good. It's worth keeping an eye on the AIDS research community on this topic, as there are a few broad structural similarities between the aged immune system and the AIDS-compromised immune system: "researchers report on a promising new technique that potentially could turn immune system killer T cells into more effective weapons against infections and possibly cancer. The technique involves delivering DNA into the immune system's instructor cells. The DNA directs these cells to overproduce a specific protein that jumpstarts important killer T cells. These killer cells are typically repressed in patients who have HIV or cancer. ... their technique proved effective in jumpstarting defective immune systems in immuno-compromised mice and in human killer T cells taken from people with HIV. .. In the study, snippets of DNA were delivered into skin instructor cells by a device known as a gene gun. The DNA directed the instructor cells to produce specific proteins, which act like molecular keys. When CD8 T cells interact with the instructor cells, the keys unlock the CD8 T cells' killer properties - jumpstarting them to go out and kill pathogens and cancer cells. With the use of this technique, the killer T cells would not need the assistance of helper T cells. So even if a tumor were to put the helper T cells in a suppressive cage, the killer T cells would still be able to go out and kill cancer cells. Researchers expect that future studies using the technique will make it applicable to many diseases, including cancer." Calorie restriction slows more or less every measure of aging, and here is another - a small study to measure decline in the nervous system cells that control a portion of the intestines: "The objective of this study was to evaluate the effects of caloric restriction (CR) on myenteric neurons in the duodenum of Wistar rats during aging. Thirty rats were divided into three groups: the C group (six-month-old animals that were fed a normal diet from weaning until six months of age), the SR group (18-month-old animals that were fed a normal diet from weaning until 18 months of age) and the CR group (18-month-old animals that were fed a 30% CR diet after six months of age). ... The neurons were counted, and the cell body areas were measured. Aging was associated with neuronal loss in the SR group, which was minimized by caloric restriction in the CR group. ... Thus, CR had a protective effect on myenteric neurons during aging." Telomeres are the ends of the chromosome, caps of repeating DNA sequences that shorten with each cell division and lengthen according to the activity of the enzyme telomerase - this is a very dynamic process, responding differently to circumstances in different cells and tissue types. Telomere length somewhat acts as a countdown clock, moving a cell towards shutdown after a certain number of divisions rather than permitting continued replication, but as for all matters biological the telomere-telomerase-chromosome system considered as a whole is exceedingly complex. It influences and is influenced by many other important cellular systems and feedback loops: mitochondrial damage, for example, appears tied to telomere length and telomerase activity. Thus even as data rolls in ever faster in this age of biotechnology, the telomere story has stubbornly remained that telomeres generally become shorter on average with age or ill health or stress, and that this shortening might be a contribution to aging or it might only be a marker for other cellular changes and damage that occurs with aging. This is an important distinction to draw: we should find ways to fix and reverse the changes that are fundamental, that are causes of aging. But we don't have to fix and reverse the markers and secondary changes. If we repair the root causes, the many other line items should take care of themselves. But biology is complicated - obtaining the answers for processes that are right down there in the depths of the cellular machinery, central to everything and touching on everything, takes time. Not surprisingly, given that species differ in many other relevant aspects of their biology, including the pattern of activity of the telomere-restoring enzyme telomerase simple comparisons of average telomere length across species do not map directly onto interspecific variation in maximum lifespan. In relatively long-lived species, telomerase is downregulated in most somatic cells, thought to have evolved as a mechanism to counteract an increased risk of tumour formation, particularly in endotherms. One potential cost of this is that tissue renewal capacity is limited, resulting in somatic deterioration with age. However, within a given long-lived species, there is good reason to predict that variation in average telomere length in somatic cells will be related to potential lifespan. Examining this link is fraught with difficulties, not least of which is that studies covering the entire lifespan of a cohort of long lived animals take a very long time. Circumventing this by looking at telomere length and subsequent survival in individuals that are already old omits all the individuals who died early in life (and who may have had the shortest telomeres). The alternative approach of comparing average telomere length in a cross sectional sample of individuals of different ages suffers from a related bias; mean telomere length could actually appear to increase with age if individuals with short telomeres die and so drop out of the sample. Furthermore, since telomere length is a dynamic character, if it is predictive of lifespan, we also need to know at what life history stage the relationship is strongest. Longitudinal studies are therefore essential. Time is the most precious thing for us, and it is unfortunate that finding the necessary information that would allow the research community to be more effective in addressing the causes of aging - by eliminating potential mechanisms from the "must fix" list - might at this point take up more time than it would save. Philosophy determines strategy - it matters greatly which of the answers to the fundamental existential questions you subscribe to. Consider questions of identity, for example: do you identify with the pattern that is you, or do you identify with the present slowly changing collection of physical structure that is you? If the former, you might consider destructively uploading the data of your mind to a robust computing system to be a fine strategy for the defeat of aging. If the latter, destructive uploading looks like an expensive and ornate suicide method - you are not your copy, and you will not survive the procedure. Doors to the future open or close depending on your philosophical inclinations. Here's a piece that reviews some of the spectrum of philosophical thinking on identity, which has been going on for a good deal longer than modern ideas and technologies have been around: "Star Trek-style teleportation may one day become a reality. You step into the transporter, which instantly scans your body and brain, vaporizing them in the process. The information is transmitted to Mars, where it is used by the receiving station to reconstitute your body and brain exactly as they were on Earth. You then step out of the receiving station, slightly dizzy, but pleased to arrive on Mars in a few minutes, as opposed to the year it takes by old-fashioned spacecraft. But wait. Do you really step out of the receiving station on Mars? Someone just like you steps out, someone who apparently remembers stepping into the transporter on Earth a few minutes before. But perhaps this person is merely your replica - a kind of clone or copy. That would not make this person you: in Las Vegas there is a replica of the Eiffel Tower, but the Eiffel Tower is in Paris, not in Las Vegas. If the Eiffel Tower were vaporized and a replica instantly erected in Las Vegas, the Eiffel Tower would not have been transported to Las Vegas. It would have ceased to exist. And if teleportation were like that, stepping into the transporter would essentially be a covert way of committing suicide." Via Extreme Longevity: "Progeria is a rare disease in which children age very rapidly, acquire diseases of the elderly and typically die in teenage years with the phenotypical appearance of the elderly. The disease has been found to occur due to mutations in the LMNA gene which codes for the nuclear envelope proteins called lamin-A and lamin-B. These proteins are responsible for the security and integrity of the nuclear membrane surrounding the cell's DNA. When these proteins are mutated the DNA is poorly protected and quickly and extensively damaged leading to accelerated aging. In this study the researchers hypothesized that just as certain single nucleotide polymorphisms (SNPs or mutations) cause individuals with progeria to age rapidly, perhaps other variants of the gene would protect people from aging and lead to extreme longevity. To test this hypothesis, the researchers compared 16 SNP variants of the LMNA gene in persons over age 95 versus genetically matched younger controls. They detected a specific 4-SNP variation of the gene appeared to be more frequent in the elderly. They then looked for the presence of this haplotype in several other genetic databases of centenarians and again found a higher frequency than chance of the same mutation. The authors concluded 'these results suggest that LMNA variants may play a role in human lifespan.'" A couple of years ago, Chinese researchers demonstrated modestly extended longevity in mice through transplantation of mesenchymal stem cells. This sort of thing is a very brute-force approach to enhanced regeneration: it's more or less the least and first possible action that can be taken after developing the technology to extract, purify, and culture stem cells outside the body. Researchers are still in the midst of gathering a full understanding of what exactly goes on under the hood in the variety of circumstances and methodologies whereby tissue is flooded with additional stem cells. But as is demonstrated by the trials and stem cell clinics around the world, there is ample evidence that benefits are possible given the right approach. Increasing evidence suggests that the loss of functional stem cells may be important in the aging process. Our experiments were originally aimed at testing the idea that, in the specific case of age-related osteoporosis, declining function of osteogenic precursor cells might be at least partially responsible. To test this, aging female mice were transplanted with mesenchymal stem cells from aged or young male donors. We find that transplantation of young mesenchymal stem cells significantly slows the loss of bone density and, surprisingly, prolongs the life span of old mice. These observations lend further support to the idea that age-related diminution of stem cell number or function may play a critical role in age-related loss of bone density in aging animals and may be one determinant of overall longevity. The mean life span of control mice was 765 days However, the mean life span for mice that received young BMSCs transplants was 890 days ... Overall, these results suggest that transplantation of BMSCs derived from young animals extends life span. However, it is not clear whether the prolonged lifespan may be associated with improved tissue regeneration. An article on recent sirtuin research - while extended longevity is demonstrated, I don't think it changes the big picture on sirtuins all that much: "Mammals, including humans, have seven types of sirtuins, called SIRT1 to SIRT7. Scientists aren't sure what these proteins do, although there is some evidence suggesting that they might help prevent chronic diseases such as cancer and cardiovascular disease. For example, resveratrol, the nutrient found in grape skins (and red wine), has been shown to have a positive effect on heart health, and it may work by activating the SIRT1 gene to make more SIRT1 protein. The Israeli researchers, led by Yariv Kanfi, focused on SIRT6. The team's previous work revealed that mice genetically bred to have lots of SIRT6 could get fat on rich diets yet show no signs of heart disease, fatty liver disease and other diseases associated with obesity. Previous research by other groups showed that mice genetically bred to have little SIRT6 don't live very long. And, conversely, rats living longer on a calorie-restricted diet have increased levels of SIRT6 in their blood. So, this time the Israeli team simply decided to let the SIRT6 mice live a natural life. These male mice lived longer, about 16 percent longer on average, than regular mice kept in the same conditions. The female mice with the SIRT6 gene enhancement didn't live longer than regular mice. The researchers speculate that, considering how male mice have a higher rate of cancers compared with the females, the SIRT6 could be acting as a tumor suppressor and thus have a larger effect on male life span than female life span." A novel viewpoint is outlined in this article, though as always it remains to be seen how important the effect is in comparison with other concrete manifestations of aging: "For decades, scientists have looked for explanations as to why certain conditions occur with age, among them memory loss, slower reaction time, insomnia and even depression. They have scrupulously investigated such suspects as high cholesterol, obesity, heart disease and an inactive lifestyle. Now a fascinating body of research supports a largely unrecognized culprit: the aging of the eye. The gradual yellowing of the lens and the narrowing of the pupil that occur with age disturb the body's circadian rhythm, contributing to a range of health problems, these studies suggest. As the eyes age, less and less sunlight gets through the lens to reach key cells in the retina that regulate the body's circadian rhythm, its internal clock. ... Circadian rhythms are the cyclical hormonal and physiological processes that rally the body in the morning to tackle the day's demands and slow it down at night, allowing the body to rest and repair. This internal clock relies on light to function properly, and studies have found that people whose circadian rhythms are out of sync, like shift workers, are at greater risk for a number of ailments, including insomnia, heart disease and cancer. ... We believe that it will eventually be shown that cataract surgery results in higher levels of melatonin, and those people will be less likely to have health problems like cancer and heart disease"
The long term goals for the field of stem cell medicine tend to come back around to include rejuvenation at some point. It's unavoidable, really: the medical conditions most obviously suited to treatment via stem cell therapies are the malfunctions and disrepair of old age - failing muscles, hearts, livers, and other more complex organs. But stem cell populations and their supporting infrastructure in the body also fail right at the time when they are most needed. (That progressive failure of stem cell capacity with age goes some way to causing the time of greatest need, of course, but it's far from the whole story of degenerative aging). The bottom line is that to ensure effectiveness for stem cell treatments in the old, efforts must be made to reverse the aging of their stem cells and the aging of stem cell support systems in the body. Unlike stem cells in the blood or skin, muscle stem cells spend most of their lives nestled in the surrounding tissue. "They don't do much most of the time," said Rando. "They remain in a quiescent state for most of a person's life. When you injure your muscle, however, they begin dividing to repair the damage. ... Although on the surface the quiescent state seems to be relatively static, it's quite actively maintained. We've found that changing the levels of just one specific microRNA in resting muscle stem cells, however, causes them to spring into action." If you're going to use muscle stem cells as a therapy for disease or aging, you want to be able to transplant cells that have the greatest potential to make new muscle in the recipient. The quiescent state most closely resembles how they are in the body. If you allow them to divide in the lab before transplantation, they are not as effective. This microRNA may allow us to toggle the cells back and forth between the actively dividing and quiescent states. In the future, the researchers will continue to look at the unique features of quiescent muscle stem cells, including those involved in normal aging. "We'd like to understand the aging process at a very fundamental level," said Rando. "That will allow us to move toward more therapeutic applications. Can we use what we've learned to convert old stem cells, which seem to have lost their responsiveness to activation cues, into young stem cells? Maybe the ability of old stem cells to exit the quiescent state is defective. We may one day be able to develop approaches that enhance tissue repair by enhancing stem cell function." Paired with increasingly effective early detection and elimination of cancer, it should be very feasible in the years ahead to postpone the decline of stem cells in the body. That decline appears to exist as a mechanism to reduce the risk of cancer, but if cancer as a worrying condition becomes a thing of the past there's no reason for us not to dial our stem cells back up to full potency to maintain our tissues better and for longer. A look at ongoing work on nerve regeneration in one laboratory: "One technology used [by] neurosurgeons is the NeuraGen Nerve Guide, a hollow, absorbable collagen tube through which nerve fibers can grow and find each other. The technology is often used to repair nerve damage over short distances less than half an inch long. ... [Researchers] compared several methods to try to bridge a nerve gap of about half an inch in rats. The team transplanted nerve cells from a different type of rat into the wound site and compared results when the NeuraGen technology was was used alone or when it was paired with [dorsal root ganglion neurons, or DRG cells], or with other cells known as Schwann cells. After four months, the team found that the tubes equipped with either DRG or Schwann cells helped bring about healthier nerves. In addition, the DRG cells provoked less unwanted attention from the immune system than the Schwann cells, which attracted twice as many macrophages and more of the immune compound interferon gamma. While both Schwann and DRG cells are known players in nerve regeneration, Schwann cells have been considered more often as potential partners in the nerve transplantation process, even though they pose considerable challenges because of the immune system's response to them. ... In a related line of research, [scientists] are creating DRG cells in the laboratory by stretching them, which coaxes them to grow about one inch every three weeks. The idea is to grow nerves several inches long in the laboratory, then transplant them into the patient, instead of waiting months after surgery for the nerve endings to travel that distance within the patient to ultimately hook up." From the Methuselah Foundation blog: "A thin layer of human skeletal muscle is being printed by Chirag Khatiwala in a small, sterile room of San Diego-based startup Organovo. Each muscle cell from the company's signature 3-D printer is uniformly deposited in closely spaced lines on a petri dish. This allows the cells to grow and interconnect until they form working muscle tissue nearly indistinguishable from a human muscle biopsy. Unlike other experimental approaches that utilize ink-jet printers to deposit cells, Organovo's technology enables cells to interact with each other the way they do in the body. How? They are packed tightly together, sandwiched, if you will, and incubated. This prompts them to cleave to each other and interchange chemical signals. When printed, the cells are grouped together in a paste that helps them grow, migrate, and align themselves properly. In the case of muscle cells, the way they orient themselves in the same direction allow for contractions of the tissue. 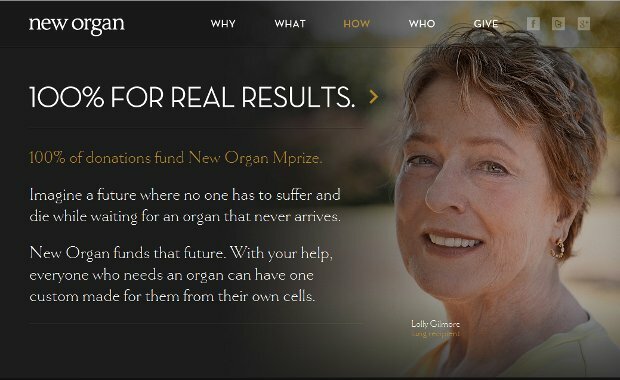 ... Methuselah Foundation honors the efforts of Organovo through early funding and support as well as through its new, highly anticipated New Organ Mprize. The true prize is elevated health and quality of life for those that have had to or will suffer the blows of a failing organ. Every $10 helps us work in tandem with today's stunningly advanced technology so that at some tomorrow, no one will have to suffer or die because of a diseased organ." This year's BIL unconference will be held on March 3rd, on the Queen Mary in Long Beach, California. BIL is an ad-hoc conference for people changing the world in big ways. It's a place for passionate people to come together to energize, brainstorm, and take action. ... Most of you have heard of TED or watched the talks online, but do you know about BIL, the quirky, populist, unconference taking place nearby? Open to the public and fully participant powered, BIL features a wild mix of technologists, scientists, artists, hackers, and those with a passion for community awareness. De Grey's research focuses on whether regenerative medicine can thwart the aging process. He works on the development of what he calls "Strategies for Engineered Negligible Senescence" (SENS), a tissue-repair strategy intended to rejuvenate the human body and allow an indefinite lifespan. To this end, he has identified seven types of molecular and cellular damage caused by essential metabolic processes. SENS is a proposed panel of therapies designed to repair this damage. Max More is an internationally acclaimed strategic philosopher widely recognized for his thinking on the philosophical and cultural implications of emerging technologies. ... At the start of 2011, he became President and CEO of the Alcor Life Extension Foundation, the world's leading cryonics organization. ... Max will give a fresh perspective on cryonics as a bridge to an indefinitely extended life. You'll find some other familiar faces in the list of participants, some of whom are also quite active in the longevity science advocacy community. The latest issue of the Cryonics magazine is available online in PDF format: "The January-February 2012 issue of Cryonics marks the return of Alcor's magazine as a bi-monthly professionally printed publication. This issue features two major articles on cryonics and brain-threatening disorders. The first article, by Cryonics editor Aschwin de Wolf, provides a framework for thinking about identity-destroying brain diseases and discusses what Alcor members can do to prevent them from threatening your cryopreservation. Alcor staff member Mike Perry returns to the topic of brain-threatening disorders and presents his updated findings on the options available to cryonicists who have been diagnosed with such a disease, (like Alzheimer's). After being CEO at Alcor for one year, Alcor CEO and President Max More reflects on his Alcor experience to date and we get a look into the interesting career of one of the pioneers of transhumanism. Another Alcor veteran, Russel Cheney, contributes an article about the importance of 'superfunding' your cryopreservation arrangements." Via the Guardian: "Fasting for regular periods could help protect the brain against degenerative illnesses ... Researchers [had] found evidence which shows that periods of stopping virtually all food intake for one or two days a week could protect the brain against some of the worst effects of Alzheimer's, Parkinson's and other ailments. ... Reducing your calorie intake could help your brain, but doing so by cutting your intake of food is not likely to be the best method of triggering this protection. It is likely to be better to go on intermittent bouts of fasting, in which you eat hardly anything at all, and then have periods when you eat as much as you want. In other words, timing appears to be a crucial element to this process. ... have also worked out a specific mechanism by which the growth of neurons in the brain could be affected by reduced energy intakes. Amounts of two cellular messaging chemicals are boosted when calorie intake is sharply reduced. ... These chemical messengers play an important role in boosting the growth of neurons in the brain, a process that would counteract the impact of Alzheimer's and Parkinson's. ... The cells of the brain are put under mild stress that is analogous to the effects of exercise on muscle cells. The overall effect is beneficial. ... The link between reductions in energy intake and the boosting of cell growth in the brain might seem an unlikely one, but [there are] sound evolutionary reasons for believing it to be the case. ... When resources became scarce, our ancestors would have had to scrounge for food. Those whose brains responded best - who remembered where promising sources could be found or recalled how to avoid predators - would have been the ones who got the food. Thus a mechanism linking periods of starvation to neural growth would have evolved." You might recall that intermittent fasting and straight calorie restriction depend on different sets of genes in mice, suggesting that they are not working to enhance health in the same ways - this latest research tends to reinforce that view. The visible future is by any sensible measure nothing less than science fiction. Any given snapshot of that future is made up of countless trillions of ageless humans, sophisticated machine intelligences, and yet to be categorized hybrids of the two, spread throughout the solar system in palatial standards of living, and beginning to drift beyond to the nearby stars - a vast thistledown of intelligence and culture, a million times greater and more diverse than today's world, just beginning its explosion into the winds. These are the Inheritors, to borrow a term from an obscure work of science fiction. The question for today is this: to what degree are we obligated by the Inheritors? They are yet to exist, but we know that we can bring them into being, and indeed seem to be headed in that direction: there is nothing especially controversial about a future cosmopolitan solar system, or the ability to defeat aging given a sufficiently long timescale to work on the necessary biotechnology. These technologies and research programs can be envisaged in some detail, and human ingenuity will achieve all of these goals in the fullness of time. (Though human nature being what it is research on the technologies of the future will be achieved painstakingly and ever so slowly on a shoestring budget, whilst the lion's share of the flow of expenditures in every society go to bread and circuses). From a utilitarian perspective, one could argue that creating and perpetuating intelligences possessed of free will, freedom, and opportunity is the highest aspiration, the greatest end goal for human action - turning clay into sentience, as it were. Speeding any step towards the technologies necessary for the existence of the Inheritors (enhanced longevity, control of disease, strong artificial intelligence, low cost orbital lift systems, and so forth) will ultimately bring a benefit that is measured in millions of lives - even in increments of a day here, a day there. This is time lived in aggregate: deaths prevented, additional person-days lived well per day, days of suffering eliminated, and so forth. Arguments for speed in longevity research based on saving lives in the future - bringing the advent of rejuvenation biotechnology one day closer will save at least 100,000 lives over the span of its introduction to the clinics, for example - are a narrow slice of broader arguments for speeding the development of the other foundation technologies of the Inheritors. But are we obligated to the future? This seems to me to be an all or nothing question: are we obligated in the sense that we agree with Aubrey de Grey when he says that the ethical thing to do is to work hard on longevity technologies because it will give our descendants the choice of whether or not to use them - rather than lazing around and bequeathing them the same lack of choice that our ancestors had? If so, then shouldn't we also be obligated to the Inheritors as a result of much the same line of reasoning? And indeed, look beyond the Inheritors. The future of humanity, unless abruptly and unexpectedly halted, is to turn our future light cone into sentient matter. On that scale of time, space, culture, and intelligence the Inheritors are a tiny primordial instant. Are we obligated to the extent of the future that we cannot well envisage, only seeing that it must be vast beyond easy comprehension? These are things to think about when you roll out of bed to face another day, and when you make the choice on your own plans and strategies for the years ahead. The bottom line is that obligation is a choice. It is choice and freedom to choose that separates obligation from slavery: the difference between working because you feel that you should and working because you are compelled. The Inheritors, being nothing more than a plausible and probably inevitable vision at this point, cannot compel the present. To help speed the day of their existence, and to work on rejuvenation biotechnology and cryonics for a shot at seeing that era with our own eyes - these are choices. Weighty choices indeed, but freely made. The present state of research in the accelerated aging condition progeria shows it to result from malformed proteins important to the structure of the cell nucleus - which is something that also occurs in normal aging, but to a much lesser degree. Here is a look at what some researchers are doing with this information - producing the tools needed to get to the next step in their investigations: "The premature aging disorder, Hutchinson-Gilford progeria syndrome (HGPS), is caused by mutant lamin A, which affects the nuclear scaffolding. The phenotypic hallmark of HGPS is nuclear blebbing. Interestingly, similar nuclear blebbing has also been observed in aged cells from healthy individuals. Recent work has shown that treatment with rapamycin, an inhibitor of the mTOR pathway, reduced nuclear blebbing in HGPS fibroblasts. However, the extent of blebbing varies considerably within each cell population, which makes manual blind counting challenging and subjective. Here, we show a novel, automated and high throughput nuclear shape analysis that quantitatively measures curvature, area, perimeter, eccentricity and additional metrics of nuclear morphology for large populations of cells. We examined HGPS fibroblast cells treated with rapamycin and RAD001 (an analog to rapamycin). Our analysis shows that treatment with RAD001 and rapamycin reduces nuclear blebbing, consistent with blind counting controls. In addition, we find that rapamycin treatment reduces the area of the nucleus, but leaves the eccentricity unchanged. Our nuclear shape analysis provides an unbiased, multidimensional 'fingerprint' for a population of cells, which can be used to quantify treatment efficacy and analyze cellular aging." You may recall that levels of high-density lipoproteins (HDL) have been shown to correlate with human longevity, such as in centenarian studies. Here is another very long term study that also shows an association, using a "fifty-three-year prospective follow-up of Gofman's Livermore Cohort between 1954 and 2008. ... One thousand one hundred forty-four men who consented to the study, had analytic ultracentrifuge measurements of lipoprotein subfractions at baseline, and were old enough at baseline to have survived to age 85 during follow-up. ... Three hundred ninety men survived to 85 years old (34.1%). Survivors were less likely than nonsurvivors to be in the lowest HDL3 and HDL2 quartiles. Logistic regression analyses showed that the lowest HDL3 quartile significantly predicted shorter longevity. ... Men who were above the 25th HDL3 percentile had 70% greater odds of surviving until age 85 than those below this level, which persisted when adjusted for HDL2, very low-density lipoprotein (LDL), and standard risk factors. Proportional hazard analyses of survival before age 85 showed that being in the lowest HDL3 quartile increased age-adjusted cancer risk by 39% and noncancer risk by 23% when adjusted for other risk factors." Via Maria Konovalenko, here is another attractive poster on the biology of aging from some of the folk behind the Russian Science for Life Extension Foundation. There are more of these documents out there than are translated to English, more is the pity, but the supply of people who can make good technical translations in cutting edge life science from Russian to English (and have both the time and motivation to do so) is limited at the best of times. The image below is low-quality - click through for the full size version. You'll also find other documents at the Science for Life Extension Foundation website (scroll down for the links) and if you're up for reading the original Russian, you'll find a great deal of similarly interesting material at researcher Alexey Moskalev's blog. One of the ways in which major blood vessels decline in function with aging is that they lose their elasticity. The state of chronic inflammation that grows with aging contributes to this, as noted in this open access paper (in PDF format). This is probably connected to the fact that exercise helps improve the elasticity of arteries, given that exercise is shown to impact levels of inflammation: "Increased arterial stiffness is an independent predictor of cardiovascular disease independent from blood pressure. Recent studies have shed new light on the importance of inflammation on the pathogenesis of arterial stiffness. Arterial stiffness is associated with the increased activity of angiotensin II, which results in increased NADPH oxidase activity, reduced NO bioavailability and increased production of reactive oxygen species. Angiotensin II signaling activates matrix metalloproteinases (MMPs) which degrade TGFβ precursors to produce active TGFβ, which then results in increased arterial fibrosis. ... There is also ample clinical evidence that demonstrates the association of inflammation with increased arterial stiffness. Recent studies have shown that reductions in inflammation can reduce arterial stiffness. In patients with rheumatoid arthritis, increased aortic pulse wave velocity in patients was significantly reduced by anti tumor necrosis factor-α therapy. ... Thus, there is rationale for targeting specific inflammatory pathways involved in arterial stiffness in the development of future drugs. Understanding the role of inflammation in the pathogenesis of arterial stiffness is important to understanding the complex puzzle that is the pathophysiology of arterial stiffening and may be important for future development of novel treatments." From Maria Konovalenko: "I am proud to announce that Science for Life Extension Foundation is one of the organizers of the 2nd international Genetics of Aging and Longevity conference. It is going to be an amazing and actually unprecedented conference focused on genetic mechanisms of aging and longevity. Check out the list of our invited speakers. I can't wait to hear the prominent researchers sharing their experience in making model animals live longer. By the way, we are proud to have all the longevity-record braking researchers, who extended the lifespan of yeast, nematodes, fruit flies and mice. You can't miss this meeting. I encourage you to go ahead and register. It's the end of April, beautiful spring in Moscow. For those who have never been here before, here's your chance to kill two birds with one stone - learn a lot about aging and discover one of the most beautiful and dynamic cities in the world." Organovo closed a private placement consisting of approximately 6.5 million units of its securities to qualified accredited investors, for total gross proceeds of $6.5 million. "Organovo's advanced bioprinting platform can replicate essential biology for research, drug discovery and development and, eventually, for therapeutic applications," stated Keith Murphy, chief executive officer of Organovo. "We have found success in achieving early revenue through strategic collaborations, and this funding will allow us to extend the reach and uses of 3D bioprinting through growth and innovation in the coming years." Dr. Forgacs ultimately foresees fully implantable organs printed from a patient's own cells. "You give us your cells: we grow them, we print them, the structure forms and we are ready to go," he says. "I am pretty sure that full organs will be on the market [one day]." A printed biological heart might not appear exactly like an embryonic heart with a pericardium, two superior atria, and two inferior ventricles. But it will perform the same function: pumping blood throughout the blood vessels. [Researchers] studied various strategies for freeze-drying porcine heart valves. After the cellular material was removed, they freeze-dried the heart valve scaffolds with or without sucrose and hydroxyl ethylene starch, and then compared the stability and elasticity of the freeze-dried scaffolds to assess the effectiveness of these lyoprotectants in preventing degradation of the scaffold. ... Tissue freeze-dried with sucrose alone displayed less porosity compared to tissue freeze-dried with the sucrose/HES mixture, whereas no significant differences in biomechanical properties were observed. Decellularization decreased the elastic modulus of artery tissue. The elastic modulus of freeze-dried tissue without protectants resembled that of decellularized tissue. The elastic modulus values of freeze-dried tissue stabilized by lyoprotectants were greater compared to those of decellularized tissue, but similar to those of native tissue. In another advance for the field, researchers have now demonstrated a strategy to fabricate tubular structures with multiple types of cells as different layers of the tube walls. This method may be widely used in simulation of many tubular tissues and enriches the toolbox for 3D micro/nanofabrication by initially patterning in 2D and transforming it into 3D. ... To demonstrate the capability of their method, the scientists successfully simulated the structure of a human vessel-like structure - the tubular wall has three layers, and in each layer there is one representative type of cells: endothelial cells, smooth muscle cells and fibroblast cells (from inside out). This kind of tubular structure with multiple types of cells can be applied in tissue engineering such as arterial and venous grafts in vivo. And [the] preparation method of stress-induced rolling membrane can be applied to fabricate other self-assembled 3D structures. You might compare the methodologies in the technology demonstration quoted above with the approach used in growing mouse teeth to get a sense of just how broad the range of necessary techniques is. I would take this as an indicator that simple, ongoing maintenance of fitness and avoidance of a sedentary lifestyle pays off: "Simple tests such as walking speed and hand grip strength may help doctors determine how likely it is a middle-aged person will develop dementia or stroke. ... More than 2,400 men and women with an average age of 62 underwent tests for walking speed, hand grip strength and cognitive function. Brain scans were also performed. During the follow-up period of up to 11 years, 34 people developed dementia and 70 people had a stroke. The study found people with a slower walking speed in middle age were one-and-a-half times more likely to develop dementia compared to people with faster walking speed. Stronger hand grip strength was associated with a 42 percent lower risk of stroke or transient ischemic attack (TIA) in people over age 65 compared to those with weaker hand grip strength. This was not the case, however, for people in the study under age 65. ... Researchers also found that slower walking speed was associated with lower total cerebral brain volume and poorer performance on memory, language and decision-making tests. Stronger hand grip strength was associated with larger total cerebral brain volume as well as better performance on cognitive tests asking people to identify similarities among objects." We might theorize that this is related to exercise and blood flow in the brain, and related effects on the heath of blood vessels in the brain. Average telomere length in at least some tissues makes a good marker for general health, but the progressive shortening of telomeres may or may not be a root cause of aging. Telomere length results from a dynamic system of lengthening and shortening processes, which seems more likely to be a reflection of underlying function and dysfunction: "In an ongoing study of almost 20,000 Danes, a team of researchers [have] isolated each individual's DNA to analyse their specific telomere length - a measurement of cellular aging. ... The risk of heart attack or early death is present whether your telomeres are shortened due to lifestyle or due to high age ... The recent Copenhagen General Population Study involved almost 20,000 people, some of which were followed during almost 19 years, and the conclusion was clear: If the telomere length was short, the risk of heart attack and early death was increased by 50 and 25 per cent, respectively. ... That smoking and obesity increases the risk of heart disease has been known for a while. We have now shown, as has been speculated, that the increased risk is directly related to the shortening of the protective telomeres - so you can say that smoking and obesity ages the body on a cellular level, just as surely as the passing of time. ... one in four Danes has telomeres with such short length that not only will they statistically die before their time, but their risk of heart attack is also increased by almost 50 per cent. Future studies will have to reveal the actual molecular mechanism by which the short telomere length causes heart attacks. Does one cause the other or is the telomere length and the coronary event both indicative of a third - yet unknown - mechanism?" I lean towards the latter hypothesis, that both risk of catastrophic failure in bodily systems and telomere length reflect levels of accumulated damage at the level of cells and macromolecules in the body. Since rejuvenation therapies will ultimately offer many more years of life than traditional life-saving interventions, a problem emerges for existing principles of medical decision-making. Justice demands that all patients are due an equal standard of medical care. But if we measure medical care in terms of the amount of life it saves, or in terms of its cost relative to its effectiveness, or even in terms of its ability to save identified individuals rather than reduce statistical risk in groups, rejuvenation will eventually be far more valuable than life-saving. More broadly, effective rejuvenation medicines will effectively erode the boundary between curative and prophylactic medicines, as well as the boundary between treatment and enhancement. The quote above is the more reasonable part of the abstract, which concurs with the sensible view that the dominant strategies in medicine must change: what happens today largely takes the form of trying to patch over late stage consequences without addressing root causes, and will thus always be expensive and ultimately unsuccessful. It is poor value in comparison to a strategy of consistently repairing low-level biological damage and thus effecting rejuvenation. That said, I should note that the whole is a viewpoint I cannot agree with. The presentation builds upon an idealized, and already incorrect, view of the British governmental heath monolith on the one hand, and the meaning of "justice" that roughly translates to "equality maintained through theft, coercion, and destruction of progress is better than honestly earned inequality" on the other. The end result is just moving deckchairs on the Titanic, painting a poisonous, failing system a different color. It'll all come to the same in the end. All systems, like the government health services in Western nations, that divorce themselves from price signaling and patient accountability for costs incurred ultimately create shortages, enforce rationing, and stagnate. They turn relationships between patient and provider from mutually beneficial trade to hostile engagement at arms length, then remove the market incentives for participants to develop and offer better services and technologies, and later the incentives that cause people to offer any form of service at all. Finally, you reach the unhappy truth about other people's money: it runs out. While they last, the current incarnation of government-run health systems will continue to greatly harm the progression of medical technology - the pace of development, the cost-effectiveness, and the directions taken. The effects of the FDA on research directions - such as the institutional discouragement of work on therapies for aging - are but one facet of this problem. The laws that remove freedom of choice in funding research and development, freedom to practice medicine, and the freedom to try new medical technologies are but another. These systems are rotten to the core, and the best thing we can do is find practical ways to work around their constraints: engaging them, trying to change them by working within the system, will only prop up these corroded, toxic hulks for that little while longer. We will all be better off when the current regime of regulation and centralized control collapses. Resveratrol in and of itself is likely not terribly interesting for work on longevity - and certainly not worthy of the hype surrounding it. The same probably goes for sirtuins in general. This, however, is still a good example of work on tracing back the pathways of action of a metabolic change agent: "Research has previously suggested that resveratrol acts through activation of the sirtuin (SIR) gene family. This gene pathway, though controversial, has been implicated in life extension across several species. It has been reported that SIR extends lifespan in much the same way as caloric restriction which itself in turn may activate SIR. It has remained unclear however if resevertrol directly activates SIR or if it acts on SIR indirectly via another intermediary biochemical pathway. The current study successfully answered that question. Using several cell biology techniques the authors were able to demonstrate that resveratrol actually functions to activate SIR indirectly. They showed that resveratrol is really a phosphodiesterase inhibitor (PDE4). They demonstrated that reducing PDE4 allows cyclic AMP (cAMP) levels in the cells to rise. cAMP then increases the activity of AMPK which next increases NAD+ which finally increases SIR. This elegant study then went on to prove that the same life extending benefits of resveratrol could be achieved in rats by administering them the PDE4 inhibitor rolipram. ... inhibiting PDE4 with rolipram reproduces all of the metabolic beneﬁts of resveratrol, including prevention of diet-induced obesity and an increase in mitochondrial function, physical stamina, and glucose tolerance in mice. " An excellent article from CNBC looks at some of the few figures in the investment community who support progress towards extended healthy lifespans: "what if 'getting old' wasn't really 'getting old?' What if aging - at least the physical deteriorations that accompany it - was something that could be prevented? It's a lofty idea, but it's one that a new breed of biotech start-ups, scientists, and prominent investors are beginning to tackle. Peter Thiel is one of those investors. ... Back in 2006, Thiel gave Cambridge anti-aging researcher Aubrey de Grey $3.5 million under the auspices of the Methusaleh Foundation, a non-profit headquartered in Springfield, Virgina, that awards scientists who are working on life-extension therapies. 'Probably the most extreme form of inequality is between people who are alive and people who are dead,' Thiel told The New Yorker. In 2010, Thiel and his partners at Founders Fund, a Bay Area venture capital firm, invested $500,000 in Halcyon Molecular, a biotech start-up whose 28-year-old founder has a 'dream to create a world free from cancer and aging.' To understand the fund's investment, you have to appreciate what Founders Fund is - or, more specifically, what it is not. 'These are not guys who care about an extra million dollars,' says Brian Singerman, a partner at Founders Fund along with Thiel. 'These are guys who wanted to do something amazing for the world.' Singerman, an early employee at Google, [came] to Founders Fund after having what he describes as an 'epic six hour epic dinner with Sean Parker.' Equal parts brilliant and idealistic, Singerman is adamant that aging is a problem that can be solved. The fund's portfolio has invested in about 14 health and biotech companies all interested in solving life's ultimate problem: death. ... We have a company that's charged with curing all viral disease, we have a company that's charged with curing several types of cancer. These are not things that are incremental approaches. It's all fine and good to have a drug that extends life by a certain amount of months or makes living with a disease easier. That's not what we're looking for. We are not looking for incremental change. We are looking for absolute cures in anything we do." Eight Years of Fight Aging! The end of last month marked the close of the eighth year of Fight Aging!, and here we are in year nine of this bullheaded endeavor - the idea that the good can eventually drive out the bad in the online world of information on aging, longevity, and what best to do about the degenerations that await us all. Optimism shines eternal, I know, but as the science of human rejuvenation becomes ever closer to reality, the shysters and the marketeers of the "anti-aging" industry must eventually go the way of the real snake oil salesmen of old, travelling cart and all. Along with them must go the apologists for aging, the people who would force death upon everyone, and the other malignant naysayers. Eight years was more than long enough for me to traverse that interesting section of life during which one first starts to notice the signs of decay - the things that don't work quite so well anymore, the initial small signs of what will be a lot worse later on. It makes it a good deal harder to avoid dwelling upon just how lousy the human condition is, all things considered. But that's all relative: I can tell you that the human condition is a raw deal because I can look ahead and see just how much of an improvement is possible through well-envisaged future technologies - not that there's anything special about being able to do that, but in this era we can be a lot more specific than our visionary ancestors. We can explain in some detail how we will defeat all disease, eliminate suffering, and of course remove aging as a threat to life and health. No serious, knowledgeable thinker can argue against these goals as possible and plausible, given our present understanding of physics and biology. We are machinery, our malfunctions are only a matter of atoms out of place, and precision control of atoms will be the basis for all of our technologies sooner or later. The world is our oyster in the realm of what is possible, but as always the question is how soon that future will arrive. To my eyes, and as I noted recently, I think that this is absolutely a question of when the serious funding turns up. Progress towards rejuvenation biotechnology - the real, make a big difference therapies, not this incremental mainstream drug development that makes up nearly all present day work - is limited far more by money now than by the will to get the job done. A decade ago, this wasn't the case; the money wouldn't even have been solicited because the research community was stuck in the conservatism of silence regarding aging. Speaking of rejuvenation through medical science was the quick road to losing your funding. It has been a privilege to watch those old attitudes dissolve so rapidly, a great deal of which is thanks to the efforts of volunteer groups like the Methuselah Foundation, outspoken advocates like Aubrey de Grey, and the support of hundred of grass-roots donors and thousands more people who made their own modest contributions to changing the culture of aging research. Every time I come across a new abstract listed in PubMed in which the authors say of their research "and this merits further investigation as the potential basis for a therapy to slow aging and extend healthy life," I am reminded to just how great a battle was won - and how recently. It was nothing less than a sea change, absolutely necessary as a precursor to what will come next. But we're not getting any younger, the wages of success are to be taken for granted, and next year it'll be "but what have you done for me lately?" Rightly so, really - resting on laurels never got anything accomplished. The near future is a matter of money, and more so than the recent past: how much is going towards the most successful organizations and those working most directly on rejuvenation biotechnology, like the SENS Foundation. Money is the limiting factor for the progress produced by those organizations, as they are still comparatively small, with much room for growth in the work they can usefully start on within weeks of a check being written. As a final thought for today, I'll note that there are days when it really doesn't seem like it has been eight years I've been doing this. But when you stop to look at the details early 2012 is a whole different world from early 2004. It might not look all that different when you stick your head out of the door, but change is happening. Another good reason to be practicing calorie restriction: "New research suggests that consuming between 2,100 and 6,000 calories per day may double the risk of memory loss, or mild cognitive impairment (MCI), among people age 70 and older. ... We observed a dose-response pattern which simply means; the higher the amount of calories consumed each day, the higher the risk of MCI. ... The study involved 1,233 people between the ages of 70 and 89 and free of dementia residing in Olmsted County, Minn. Of those, 163 had MCI. Participants reported the amount of calories they ate or drank in a food questionnaire and were divided into three equal groups based on their daily caloric consumption. One-third of the participants consumed between 600 and 1,526 calories per day, one-third between 1,526 and 2,143 and one-third consumed between 2,143 and 6,000 calories per day. The odds of having MCI more than doubled for those in the highest calorie-consuming group compared to those in the lowest calorie-consuming group. The results were the same after adjusting for history of stroke, diabetes, amount of education, and other factors that can affect risk of memory loss. There was no significant difference in risk for the middle group." A recent trial shows benefits: "treating heart attack patients with an infusion of their own heart-derived cells helps damaged hearts re-grow healthy muscle. Patients who underwent the stem cell procedure demonstrated a significant reduction in the size of the scar left on the heart muscle by a heart attack. Patients also experienced a sizable increase in healthy heart muscle following the experimental stem cell treatments. One year after receiving the stem cell treatment, scar size was reduced from 24 percent to 12 percent of the heart in patients treated with cells (an average drop of about 50 percent). Patients in the control group, who did not receive stem cells, did not experience a reduction in their heart attack scars. ... While the primary goal of our study was to verify safety, we also looked for evidence that the treatment might dissolve scar and regrow lost heart muscle. This has never been accomplished before, despite a decade of cell therapy trials for patients with heart attacks. Now we have done it. The effects are substantial, and surprisingly larger in humans than they were in animal tests. ... In the past, all we could do was to try to minimize heart damage by promptly opening up an occluded artery. Now, this study shows there is a regenerative therapy that may actually reverse the damage caused by a heart attack." One of the biggest challenges inherent in organizing your own cryopreservation in the US is that all of the best, most comfortable, and most optimal ways of timing the end of your life are illegal - not just for you, but for everyone who would be involved in helping you. This makes the act of cryopreservation vastly more expensive and prone to delays that will cause extensive damage to the fine structure of the brain, and all of this stems from the interference of state employees, enforcing laws made by other state employees who are both unaccountable and uncaring. Try to do the morally right thing and end up in jail. Thus teams must be on standby for weeks or months for any given patient who is approaching the end of their life, the patient must suffer through to the bitter end, and the time from notice of death to cooled vitrification of the body is inevitably much longer than it might otherwise be. This is why the right to self-determination in end of life choices, and the right to contract to help people enact those choices by providing goods and services, is so important for the cryonics community. But it should be important for everyone interested in enhanced human longevity: a government whose employees grant themselves the right to decide the timing of your death is a government that can also reach out to make it very hard to extend your life even if the means are available. And in fact, there is a lot of that already going on in the fact that therapies for aging cannot be approved for use in the US under the present system of regulation. That fact already goes a long way towards suppressing research and development towards that end goal. At root, this all comes back to self-ownership and self-determination: is it your life and your body? From modern government employees, the answer is largely "no." One way that you can time your exit (and entry into the cryopreservation process) is to refuse food and water. It's not pleasant and requires determination, although some say it gets easier after the first couple of days. This is not treated as a suspicious death if you are already terminal with cancer or something else deadly. Alcor members who expect to die soon (you are eligible for hospice care if the doctor thinks you have less than six months) can optimize their cryopreservation by relocating to hospice in Scottsdale and then refuse food and fluids. This leads to a fairly predictable decline with our standby team on hand. In this situation, the time from pronouncement to arrival at Alcor (after administering medications, restoring circulation, and starting cooling) can take less than 30 minutes. Which is excellent advice, and something to write down for later use. Yet this is what it comes to in our caring modern centralized societies, so caged in by laws, and supposedly all for our own good. All the truly good choices are closed to a dying person and those who care for him, leaving this one practical choice that is only good in comparison to the horrible alternatives. A moral society would be replete with services that enable the end of life to be engineered in any one of the presently available safe, rapid, and painless ways, methods that would merge well with cryopreservation to enable the best possible result in terms of quality of preservation. Yet we are clearly very far from that ideal. Researchers are working on many different approaches to spur regrowth of blood vessels in the body. Here is one of them: "researchers have demonstrated a new and more effective method for regrowing blood vessels in the heart and limbs ... The treatment method [could] allow doctors to bypass surgery and instead repair damaged blood vessels simply by injecting a lipid-incased substance into a patient. Once inside the body, the substance stimulates cell growth and spurs the growth of new blood vessels from pre-existing ones. ... Others have tried using growth factors to stimulate vessel growth in clinical trials and have not been successful. We think that a major reason for this is that previous methods assumed that the diseased tissues retained the ability to respond to a growth stimulus. Our method basically delivers extra components that can restore growth factor responsiveness to the tissue of patients with long-standing clinical disease. ... The method combines a growth factor - a substance capable of stimulating cellular growth, proliferation and cellular differentiation, as well as healing wounds - known as fibroblast growth factor 2 (FGF-2) with a lipid-embedded receptor to enhance its activity. A challenge for scientists and engineers, however, has been getting FGF-2 to bind with cell receptors - the very molecules often found on the surface of the cell that receive chemical signals and direct activity in the cell from outside sources. To overcome this, [the new] method embeds the growth factors in synthetic lipid-based nanoparticles containing a coreceptor known as syndecan-4. The nanoparticles containing co-receptors that, when delivered with the growth factor, enable improved cell binding so that the growth factor can direct the targeted cell to divide, proliferate and form new cells for tissue regrowth. The incased substance was injected into rats with hindlimb ischemia and stimulated a complete recovery from the ischemia in just seven days." Researches have been boosting stem cell populations via the method demonstrated here for more than five years, but here they're demonstrating a better and more refined outcome: "myelin [is] a material that forms a protective, insulating cape around the axons of our nerve cells so that they can send signals quickly and efficiently. But myelin, and the specialized cells called oligodendrocytes that make it, become damaged in demyelinating diseases like multiple sclerosis (MS), leaving neurons without their myelin sheaths. As a consequence, the affected neurons can no longer communicate correctly and are prone to damage. ... We've developed a gene therapy to stimulate production of new oligodendrocytes from stem and progenitor cells - both of which can become more specialized cell types - that are resident in the adult central nervous system. In other words, we're using the brain's own progenitor cells as a way to boost repair. ... The therapy uses leukemia inhibitory factor (LIF), a naturally occurring protein that was known to promote the self-renewal of neural stem cells and to reduce immune-cell attacks to myelin in other MS mouse models. ... What hadn't been done before our study was to use gene therapy in the brain to stimulate these cells to remyelinate. ... It was thought that you could use factors to stimulate the division and expansion of the progenitor population, and then add additional factors to direct those progenitors to turn into the mature myelin-forming cells. But in our mouse model, when we give our LIF therapy, it both stimulates the proliferation of the progenitor cells and allows them to differentiate into mature oligodendrocytes." Something to think about: outstanding success for the SENS Foundation and its mission would look something like the assured availability of $100-300 million for research and development. That much money tends to build the successes and cachet needed to attract more of the same. To get to this point from where the Foundation stands now (a yearly budget around $1 million for the SENS Foundation, and an unknown but likely smaller level of unaffiliated funding for the same goals) might take twenty years of steady growth and success, with the end result being a substantial persuasion and conversion of the present research and funding culture for medical development. That wouldn't mean that the SENS Foundation would be a $100 million giant, or even necessarily still exist, but it would give rise to a diverse and competitive community that inherits the founders' values and goals - to defeat aging by building rejuvenation biotechnology more or less as presently envisaged in the SENS platform. So what happens if a fellow with a net worth of $100-300 million becomes a zealot for the cause, overnight perhaps, and decides to put his net worth behind the SENS cause because without life and health, what is money? I use the world zealot in the best possible way here: someone who values the cause greatly enough to spend more time and money than most other people consider reasonable - but in this case is entirely justified, given the present harms caused by aging. But what happens if the community acquires such a zealot? To my eyes it looks like we would gain two decades of headway, and projects that would otherwise languish for twenty years would commence immediately. In a pattern of growth that is limited only by the level of investment - which is exactly where rejuvenation biotechnology is today - everything in the timing hinges on when the money arrives. (It's a little more complex than this, of course, given that biotechnology is rapidly improving and costs for any given life science research project will fall rapidly over time - but you get the picture. Early money is still very much better than waiting). The interesting question is why this doesn't happen: there are a fair number of very wealthy people in the world, and logic suggests that the best possible use for much those resources from their individual perspectives would to buy more life - since we are now in an age in which it is possible to make a run at buying significantly more life. What is wealth to the sick or the dead when it comes to it? But I don't think that this is a "why don't more people support engineered longevity?" sort of a question. My suspicion is that it is not just longevity science that looks in vain for wealthy zealots, but that in general any grand cause that people can feel very strongly about also lacks wealthy zealots. It seems to me that there is in fact little overlap between the small population of zealots for a cause, people willing to devote their working life and significant resources to a grand project, and the small population of very wealthy people, those with a net worth of $100 million and up. We can speculate as to why this might be. For example, I might try to argue that the sort of person who can successfully run the long and unlikely process of becoming very wealthy is the sort of person who doesn't think about what they can do with money. They are not doing what they do for money, and the process is their passion. Someone who was a zealot for a cause would have stepped off that process long before reaching the possibility of attaining a very high net worth. Having a mere seven figure net worth for most people enters the territory of being able to prioritize volunteering over working, or funding a small mission in their favored charity. The temptation to break off and work on doing good rather than continually doubling down and doubling down on the process is ever there. Or to put it another way, the passion for the process that will make a person wealthy takes up the much the same mental space as the passion for a cause: there are only so many hours in the day, and only so much attention that a person can give to any one set of information. So you are unlikely to see a person who has (a) accomplished the necessary devotion to work and process for a shot at becoming very wealthy, but also (b) put in the necessary work and process to become a zealot. Or to put it yet another way, neither becoming exceedingly wealthy nor becoming a zealot are things that just happen one day out of the blue. They are each a fair way down their own different paths of effort, realization, and specialization. This sort of thinking is the flip side of considering persuasion, high net worth philanthropy, and fundraising in general. It suggests that persuasion is exactly necessary because, for one, the odds of a funding source emerging from the pool of already-persuaded-and-fully-into-it supporters is pretty remote. Secondly, the odds are equally low that any particular high net worth individual or organization will suddenly get the picture of their own accord and begin pouring out money like water. These are different worlds, different views, different life courses that touch at few points - so people must set out to deliberately try to bring them together. Very small embryonic like stem cells (VSELs) are purified from adult tissues and are potential sources of stem cells for application in regenerative medicine and stem cell therapies. ... A question that is important from the developmental point of view is why pluripotent stem cells, (PSCs) such as VSELs, would reside in adult organs? For many years, it had been accepted that adult tissues contain only tissue-committed stem cells (TCSCs) that have limited possibility of differentiation - for example, epidermal stem cells, hematopoietic stem cells, skeletal muscle stem cells. Ratajczak has comments on longevity and regenerative medicine - it's always good to see noted researchers stepping up to support the goal of engineered longevity in public, given that it's only been a handful of years since that sort of freedom of opinion became possible for researchers who wished to retain their funding sources. One of the many necessary preconditions for widespread support of longevity science is that researchers must speak out in favor of rejuvenation biotechnology. I am deeply convinced that regenerative medicine is our key to a better life and our key to extending lifespan. I believe that we will be able to employ [pluripotent stem cells] (e.g., VSELs), isolated from adult tissues, to harness stem cells to regenerate damaged organs. In combination with developing scaffold-technologies, we may be able to generate ex vivo organ fragments or even whole organs and replace organ transplantations with in vitro generated ones. We propose, based on our experimental data in animal models, that gradual decrease in the number of VSELs deposited in adult tissues, which occurs throughout life in an [insulin/insulin growth factor] signaling-dependent manner is an important mechanism of aging. Which is much the view that the research community has on stem cells as a whole: stem cells and their capacity to maintain tissue decline with age, for reasons that are being explored in detail, and which may in the near future be addressed in a number of different ways. Imagine a future where no one has to suffer and die while waiting for an organ that never arrives. New Organ funds that future. With your help, everyone who needs an organ can have one custom made for them from their own cells. 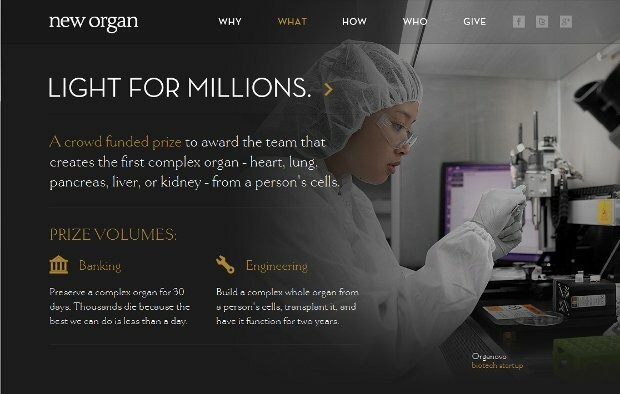 A crowd funded prize to award the team that creates the first complex organ - heart, lung, pancreas, liver, or kidney - from a person's cells. Banking: Preserve a complex organ for 30 days. Thousands die because the best we can do is less than a day. Engineering: Build a complex whole organ from a person's cells, transplant it, and have it function for two years. As we walk the road of life, ever more set upon by subtle decay and damage along the way, our health and remaining life expectancy becomes ever more dependent on the state of medical technology. It would be good to wake up twenty years from now knowing that you had made a reasonable contribution in those past decades towards helping ensure your own life and health. When we get to the point in old age at which we need, as a matter of life and death, futuristic tissue engineering and regenerative medicine that can rebuild us from the inside, we'll only have ourselves to blame if it is not yet developed and deployed. The course ahead for the science of human rejuvenation and regeneration is very clear, and whether or not it happens is largely a matter of money and will - how many people are persuaded to work on it, and how greatly are they funded. So do your part to help! It's not as though you have anything to lose. There are multiple mechanisms that contribute to the progression of insulin resistance with aging. The most significant contributions seem to stem from excess fat tissue and a sedentary lifestyle, and the metabolic consequences of those choices. (Yes, being fat is absolutely a choice for nearly all people, and one that they could begin to reverse at any point in time by changing the way they live their lives). Avoiding diabetes is a very plausible goal if you keep in shape - but even the most fit of elderly folk suffer some degree of rising insulin resistance and metabolic dysfunction as a consequence of the accumulating biological damage of aging. There is the insulin resistance you can escape, and then there is the insulin resistance you can't. One line item that crops up when discussing the intersection of exercise, inflammation and insulin resistance, and the course of aging is NF-κB - one of the many machine parts in the cell that seems to have a finger in every pie by virtue of being involved in the process of manufacturing other machine parts. Manipulating NF-κB can extend life in flies, and has beneficial effects in other laboratory animals. Here, a couple of recently published papers look at NF-κB as a regulator of insulin resistance - avoidable and otherwise - and possible target for old-style drug development. Endothelial NF-κB in Obesity and Aging: Is Endothelial NF-κB a Master Regulator of Inflammation and Insulin Resistance? Insulin resistance is a major characteristic of type 2 diabetes and develops in multiple organs including skeletal muscle, liver, adipose tissue, and heart. Insulin resistance is caused by obesity and therefore establishes an important causal relationship between obesity and type 2 diabetes. Insulin resistance also develops in aging, but this process is less well understood. To examine the role of endothelial NF-κB signaling in vivo, we generated transgenic mice [that] exhibited functional inhibition of NF-κB signaling specifically in endothelial cells. Although [the] mice displayed no overt phenotypic changes when young and lean, they were protected from the development of insulin resistance associated with obesity, whether diet- or genetically-induced. In addition to inhibition of obesity-related metabolic deteriorations, blockade of endothelial NF-κB signaling prevented age-related insulin resistance and vascular senescence and, notably, prolonged lifespan. These anti-aging phenotypes were also associated with decreased oxidative stress markers, increased muscle blood flow, enhanced active-phase locomotor activity and aortic up-regulations of mitochondrial sirtuin-related proteins. ... Endothelial NF-κB signaling is a potential target for treating the metabolic syndrome as well as for anti-aging strategies. At the present pace, by the late 2020s researchers will be able to tell you exactly why, how, and how much common lifestyle choices impact your future health and life expectancy. But it's worth noting that this won't help you live any longer - you could make the same smart choices now as you would if presented with a much thicker bundle of scary evidence. The 80/20 of present day widely available health practices is easy to achieve, after all: calorie restriction and regular exercise. None of this, however, gets us any close to true rejuvenation biotechnology. For that, we need more resources heading towards the work of the SENS Foundation and their allies in the research community. As I mentioned the other day, there are more economic benefits to enhanced human longevity than just the obvious ones. Some of these benefits emerge from systematic changes in the interactions and relationships that make up society: the willingness to consider longer time horizons changes the way in which people value all sorts of things, both in the present and for the future. If fifty years from now is someone else's problem in your eyes, you are unlikely to be a good steward of fifty-year bonds - but if you are going to be alive, vocal and very much in the picture five decades from now, then the way in which you look at these things becomes completely different. You can substitute forests, farmland, houses, familial relations, companies, or a range of other entities for the fifty-year bonds there: we humans instinctively put a value on everything, and there's nothing wrong with that. The more that people value their relationships, possessions, future earnings, and a hundred other line items, the more willing they are to invest in maintaining these tangible and intangible entities. This incentive to invest and improve is important, because short-termism is the road to ruin in all things economic - and everything that we do is in the general sense an economic decision. All wealth and civilization is built upon the move away from short-termism, to depart from the practice of strip-mining the present because you believe you are unlikely to benefit from the future. As the expectancy of human life increased over the past few centuries, so the time horizons of our ancestors broadened, and they became more likely to take actions that increased wealth: planning for the long term, investing in technology and research, trading rather than war, and building rather than tearing down. As a species, we are of course very much still mad, illogical barbarians by any absolute measure. But we are less so than now than in past generations - less violent at least, and more compassionate, although still just as deluded when it comes to a great many other topics, such as belief in the existence of dubiously benevolent sky gods. A great deal of that progress can be attributed to the changing incentives and values brought by increased longevity - and then the compound interest of small gains, amassed year after year. It is not unreasonable to regard a cell as a machine that is constantly rebuilding itself - organelles and protein machinery are constantly torn down and replaced. It is also not unreasonable to regard tissue as a collection of cells that is constantly rebuilding itself: cells destroy themselves or are destroyed by watchdog systems, and new cells are created to replace them. This sort of thing happens rapidly indeed in some parts of the body, such as the blood and stomach lining, but there are portions of your nervous system where cells will never be replaced under normal circumstances - the cells you were born with are the very same cells you have now. These long-lived cells are the most vulnerable to forms of age-related damage involving build up of metabolic waste products, and the related slow failure in the ability of cells to recycle their own damaged components. There is no fallback to replacing cells wholesale in this case, or at least not in our species, so long-lived cells must forge ahead and struggle to do their job no matter how damaged they are. The existence of these cells is a good argument for the need for in situ repair technologies, able to reverse damage and remove other hinderances in order to allow long-lived cells to regain their vigor and function - goals that are hard to attain with the present generation of cell replacement technologies emerging from the field of regenerative medicine. The scientists discovered that certain proteins, called extremely long-lived proteins (ELLPs), which are found on the surface of the nucleus of neurons, have a remarkably long lifespan. While the lifespan of most proteins totals two days or less, the Salk Institute researchers identified ELLPs in the rat brain that were as old as the organism. ... ELLPs make up the transport channels on the surface of the nucleus; gates that control what materials enter and exit. Their long lifespan might be an advantage if not for the wear-and-tear that these proteins experience over time. Unlike other proteins in the body, ELLPs are not replaced when they incur aberrant chemical modifications and other damage. The fundamental defining feature of aging is an overall decline in the functional capacity of various organs such as the heart and the brain. This decline results from deterioration of the homeostasis, or internal stability, within the constituent cells of those organs. Recent research in several laboratories has linked breakdown of protein homeostasis to declining cell function. ... Most cells, but not neurons, combat functional deterioration of their protein components through the process of protein turnover, in which the potentially impaired parts of the proteins are replaced with new functional copies. Our results also suggest that nuclear pore deterioration might be a general aging mechanism leading to age-related defects in nuclear function, such as the loss of youthful gene expression programs. Given how much longer humans live in comparison to rats, it may be that there are no proteins in the human body that never turn over. But I wouldn't be surprised to find that the situation for old humans is exactly the same as described above for old rats. An advance in the methodologies of nerve repair: "scientists believe a new procedure to repair severed nerves could result in patients recovering in days or weeks, rather than months or years. The team used a cellular mechanism similar to that used by many invertebrates to repair damage to nerve axons. ... We have developed a procedure which can repair severed nerves within minutes so that the behavior they control can be partially restored within days and often largely restored within two to four weeks. If further developed in clinical trials this approach would be a great advance on current procedures that usually imperfectly restore lost function within months at best. ... nerve axons of invertebrates which have been severed from their cell body do not degenerate within days, as happens with mammals, but can survive for months, or even years. The severed proximal nerve axon in invertebrates can also reconnect with its surviving distal nerve axon to produce much quicker and much better restoration of behaviour than occurs in mammals. ... Severed invertebrate nerve axons can reconnect proximal and distal ends of severed nerve axons within seven days, allowing a rate of behavioural recovery that is far superior to mammals. In mammals the severed distal axonal stump degenerates within three days and it can take nerve growths from proximal axonal stumps months or years to regenerate and restore use of muscles or sensory areas, often with less accuracy and with much less function being restored. ... The team described their success in applying this process to rats ... The team were able to repair severed sciatic nerves in the upper thigh, with results showing the rats were able to use their limb within a week and had much function restored within 2 to 4 weeks." To what degree does nuclear DNA damage contribute to aging? That remains a debated question. Here, researchers show that, at least in immune cells, there are perhaps more forms of large DNA damage than thought in the old: "researchers compared the DNA of identical (monozygotic) twins of different age. They could show that structural modifications of the DNA, where large or small DNA segments change direction, are duplicated or completely lost are more common in older people. The results may in part explain why the immune system is impaired with age. During a person's life, continuous alterations in the cells' DNA occur. The alterations can be changes to the individual building blocks of the DNA but more common are rearrangements where large DNA segments change place or direction, or are duplicated or completely lost. ... The results showed that large rearrangements were only present in the group older than 60 years. The most common rearrangement was that a DNA region, for instance a part of a chromosome, had been lost in some of the blood cells. ... Rearrangements were also found in the younger age group. The changes were smaller and less complex but the researchers could also in this case show that the number of rearrangements correlated with age. ... We were surprised to find that as many as 3.5 percent of healthy individuals older than 60 years carry such large genetic alterations. We believe that what we see today is only the tip of the iceberg and that this type of acquired genetic variation might be much more common. ... The researchers believe that the increased number of cells with DNA alterations among elderly can have a role in the senescence of the immune system. If the genetic alterations lead to an increased growth of the cells that have acquired them, these cells will increase in number in relation to other white blood cells. The consequence might be a reduced diversity among the white blood cells and thereby an impaired immune system." Compare that with the other explanations for reduced diversity that involve persistent and pervasive viruses like CMV. 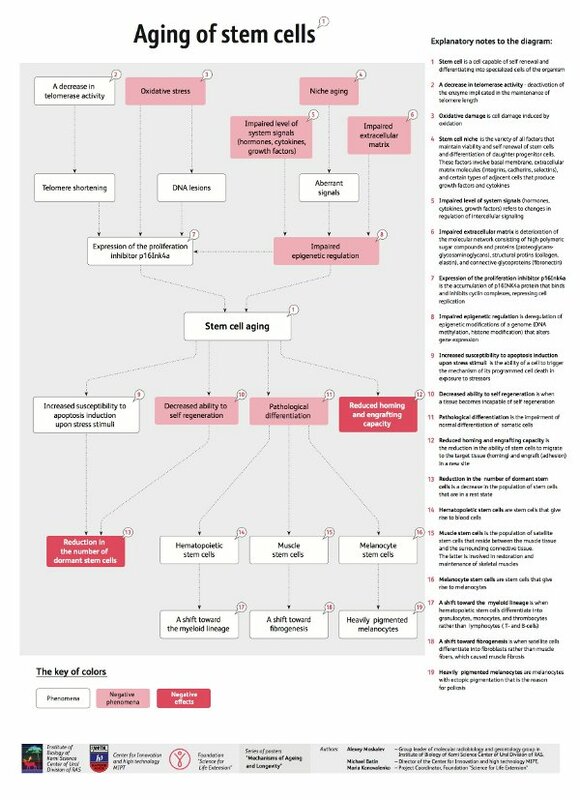 Immunotherapy is a very broad and active field: there are a great many strategies presently under development, and in various stages of maturity. All aim at making the immune system do the heavy lifting of finding and destroying specific unwanted cells, cellular machinery, and other biochemicals in the body. This is actually the immune system's evolved purpose, more or less, and so adjusting it to destroy new targets without causing harmful side-effects is a plausible near term technology. Thus there are large segments of the life science community looking into immunotherapies for cancer, immunotherapies to destroy some of the harmful aggregates that build up between cells with age, and so forth. One of the perils of aging is the accumulation of various protein/peptide aggregates throughout the body, some of which are associated with toxicity. In several age-related disorders, aggregates of certain amino acid sequences are much more prominent than under normal conditions, and define the disease. Harnessing the immune system has emerged in recent years as a promising approach to treat these conditions. My laboratory has worked in this field targeting the amyloid-β peptide, the prion protein, the tau protein, and more recently the islet amyloid polypeptide. The focus of my talk will be on our tau immunotherapy studies. We have shown in tangle mouse models that active or passive immunizations clear pathological tau aggregates from the brain with associated functional benefits. A thought to leave you with: the more we see the research community working on immunotherapies for age-related conditions, there more likely it becomes that significant investments will be made into reversing the decline of the immune system. The effectiveness of these therapies to a degree depends on the effectiveness of the immune system, and that progressively fails with age - having first generation therapies in the market will ensure that there exists a strong incentive to improve those therapies, and one of the most obvious ways to do that is to rejuvenate the immune system in elderly patients. From the Wall Street Journal, a good example of the way in which much of present day research gravitates towards applications that patch over end-stage consequences of disease rather than addressing root causes and prevention: "Research into how iron, copper, zinc and other metals work in the brain may help unlock some of the secrets of degenerative diseases like Alzheimer's and Parkinson's. Iron and copper appear to accumulate beyond normal levels in the brains of people with these diseases, and a new [study] shows reducing excess iron in the brain can alleviate Alzheimer's-like symptoms - at least in mice. ... Research into the complicated, invisible roles these metals play in brain diseases has lagged behind study of the more-visible proteins that are damaged or clump together in the brains of Alzheimer's and Parkinson's sufferers. But better understanding metals' role in the brain could help shed light on a range of medical conditions and might offer a new route for developing treatments. ... [Researchers] examined the amount of iron in the brains of mice that were bred unable to produce the tau protein, which helps stabilize the structure of neurons. Tau damage is associated with Alzheimer's and Parkinson's. As the mice aged, they suffered symptoms similar to people with both diseases, including impaired short-term memory, and also exhibited an accumulation of iron in their brains. When the researchers gave them a drug removing excess iron, the symptoms reversed. This means normally functioning tau is necessary for removing iron in the brain ... The finding bolsters previous research showing that bringing down iron may be a path to new treatments. ... An accumulation of iron in neurons seems to be a final end-stage event in neurodegeneration, whether it be Alzheimer's or Parkinson's, [or] any [condition] related to tau abnormalities." Researches find another way in which the brain declines with age: "New findings [reveal] a novel mechanism through which the brain may become more reluctant to function as we grow older. ... researchers examined the brain's electrical activity by making recordings of electrical signals in single cells of the hippocampus, a structure with a crucial role in cognitive function. In this way they characterised what is known as "neuronal excitability" - this is a descriptor of how easy it is to produce brief, but very large, electrical signals called action potentials; these occur in practically all nerve cells and are absolutely essential for communication within all the circuits of the nervous system. ... The [researchers] identified that in the aged brain it is more difficult to make hippocampal neurons generate action potentials. Furthermore they demonstrated that this relative reluctance to produce action potential arises from changes to the activation properties of membrane proteins called sodium channels, which mediate the rapid upstroke of the action potential by allowing a flow of sodium ions into neurons. ... Much of our work is about understanding dysfunctional electrical signalling in the diseased brain, in particular Alzheimer's disease. We began to question, however, why even the healthy brain can slow down ... Previous investigations elsewhere have described age-related changes in processes that are triggered by action potentials, but our findings are significant because they show that generating the action potential in the first place is harder work in aged brain cells. Also by identifying sodium channels as the likely culprit for this reluctance to produce action potentials, our work even points to ways in which we might be able modify age-related changes to neuronal excitability, and by inference cognitive ability." You might compare this with past work on potassium channels and memory in aging. Are you presently working on a life science or medical degree? Are you interested in advancing aging and longevity science - research that aims to extend the healthy human life span and reverse the causes of age-related disease? Do you want to intern this summer at the SENS Foundation, one of the most important young non-profits in the world? In the summer of 2012, the Academic Initiative will bring as many as three students to the SENS Foundation Research Center in Mountain View, California to participate in SENS research for three months. These students will receive monthly stipends and, if they are not local to the San Francisco Bay Area, a credit towards airfare. Undergraduate, graduate, and medical students may apply, as may students who have graduated immediately prior to the summer. After an initial selection process, the most promising candidates will be interviewed over the phone by the SENS researchers they would work with. Each major research program at the Research Center will limit itself to one intern, such that each intern will be working on a different project and will be selected by different researchers. It will be important for applicants to have prior lab experience, and more experienced applicants are more likely to be accepted than relatively inexperienced ones. The application is available online here. Applications are due by March 31, 2012. The most promising applicants will be interviewed in April. As always, if you have any questions, you can contact us. Chances to work on the foundations of world-changing research programs don't wander past the window every day. Beyond that, the SENS Foundation is a great place for younger researchers - people who are serious about longevity science and have a genuine interest in advancing the state of the art - to come into contact with a network of more experienced peers, fundraisers, and advocates that will serve well in later years. Connections are what makes the world go round, and certainly what advances careers and opens doors. The extracellular matrix (ECM) surrounds and supports cells, both structurally and in a range of other ways, such as by mediating cell signalling. With age, however, the ECM changes for a variety of reasons - it is damaged by the actions of senescent cells, for example. This has consequences, such as on the capacity of stem cells to maintain tissue. 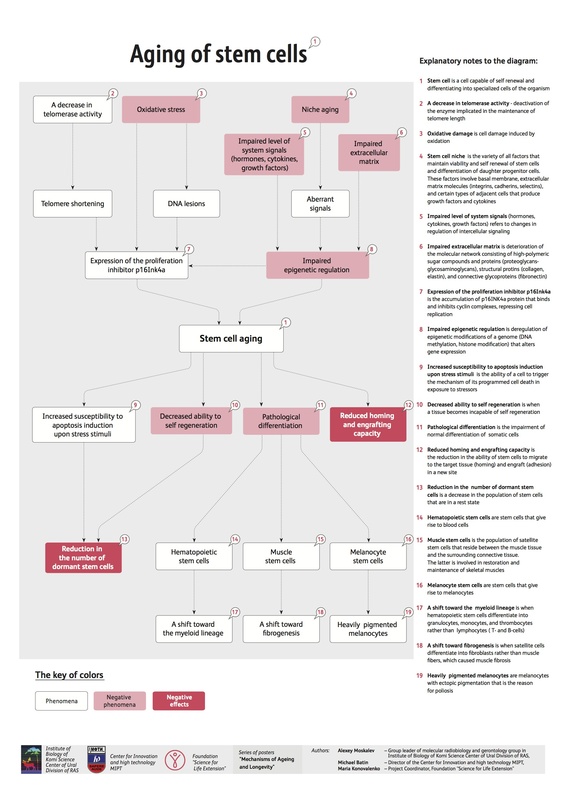 Here is a review paper: "Aging is characterized by reduced tissue and organ function, regenerative capacity, and accompanied by a decrease in tissue resident stem cell numbers and a loss of potency. The impact of aging on stem cell populations differs between tissues and depends on a number of non cell-intrinsic factors, including systemic changes associated with immune system alterations, as well as senescence related changes of the local cytoarchitecture. The latter has been studied in the context of environmental niche properties required for stem cell maintenance. Here, we will discuss the impact of the extracellular matrix (ECM) on stem cell maintenance, its changes during aging and its significance for stem cell therapy. ... It is concluded that a remodeled ECM due to age related inflammation, fibrosis or oxidative stress provides an inadequate environment for endogenous regeneration or stem cell therapies." The question of whether an old body can fully benefit from stem cell therapies continues to arise - eventually the stem cell research community will have to start addressing the damage of aging in order to assure the performance of their therapies when treating the old. Autophagy is very important to long term health, and shows up again and again as a pivotal part of the way in which various genetic manipulations and lifestyle choices can improve health and extend life. Here is a good article that delves into the mechanisms of autophagy and the present limits of scientific understanding: "Cells live longer than their internal components. To keep their cytoplasm clear of excess or damaged organelles, as well as invading pathogens, or to feed themselves in time of nutrient deprivation, cells degrade these unwanted or potentially harmful structures, and produce needed food and fuel, using a process they have honed over millions of years. Known as autophagy, this catabolic process involves the selection and the sequestration of the targeted structures into unique transport vesicles called autophagosomes, which then deliver the contents to lysosomes where they are degraded by lytic enzymes. ... Experimental evidence indicates that autophagosome biogenesis is probably a very complex process on several levels, including its regulation in response to different cellular and environmental cues, and the factors governing the choice of membrane sources. Is there any therapeutic value in determining the origin of the autophagosomal membranes? We think that elucidating this process could ultimately provide new drug targets for the treatment of diseases that can be alleviated or cured by the activation of autophagy, including specific muscular dystrophies, persistent infections, and neurodegenerative disorders (ataxias, Huntington's, and Parkinson's diseases). Understanding the sources and processes by which the autophagosome's lipid bilayers are delivered will undoubtedly reveal critical new proteins and articulate their functions, allowing researchers to pinpoint specific parts of the pathway."